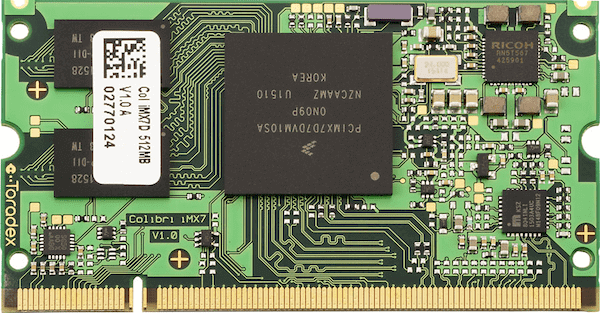 The i.MX7 SoC is a Hybrid multi-core processor composed by Single/Dual Cortex A7 core and Single Cortex M4 core. Zephyr was ported to run on the M4 core. In a later release, it will also communicate with the A7 core (running Linux) via RPmsg. The Colibri iMX7D Computer on Module with Colibri Evaluation Board was tested with the following pinmux controller configuration. The iMX7D SoC has seven UARTs. The number 2 is configured for the console and the remaining are not used/tested. The Colibri iMX7D doesn’t have QSPI flash for the M4 and it needs to be started by the A7 core. The A7 core is responsible to load the M4 binary application into the RAM, put the M4 in reset, set the M4 Program Counter and Stack Pointer, and get the M4 out of reset. The A7 can perform these steps at bootloader level or after the Linux system has booted. To run Zephyr Binary using J-Link create the following script in order to get the Program Counter and Stack Pointer from zephyr.bin. With these mechanisms, applications for the colibri_imx7d_m4 board configuration can be built and debugged in the usual way (see Build an Application and Run an Application for more details).